Caution children at play. 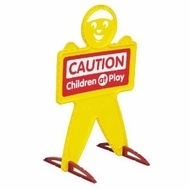 This safety sign can be placed in the yard to heighten driver awareness. The signs includes large colorful warnings on both sides. Measures 20 1/8 inches 17 5/8 inches 33 1/8 inches .